The Glasgow to Edinburgh Canoe Trail follows 87km of canal from Pinkston Watersports in Glasgow City Centre across the Central Belt to the heart of Edinburgh. You’ll have plently of things to see and do along the Trail. The handy route map and information panels along the route will give you lots of ideas! The Trail is suitable for paddlers of all abilities. With access and egress points, map, guide and safety information, you’ll have everything you need to get on the water. Move your paddle from the Forth & Clyde Canal to the Union Canal at The Falkirk Wheel, or head down to see The Kelpies at The Helix! 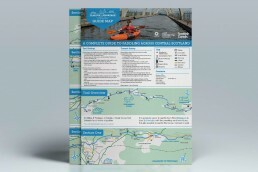 We worked as part of a geographically diverse team, to deliver trail maps for this exciting new leisure trail.